I have a big family. No seriously, I mean a BIG family. There are 6 children in my family, so that right there my family is probably bigger than your average family. Start counting up spouses and children and it keeps on growing. My parents have 13 grandchildren, and they are now getting older and having spouses of their own. But my family doesn’t stop there. My mom has 3 siblings and on her side of the family alone I have 14 first cousins. Which is big, but they are not the kind of first cousins who I see only randomly and on rare occasion. They are first cousins who I still know very well and, for the most part, see on a regular basis. I am very fortunate that when we were growing up we had a family place where we could all go. My grandfather bought a lake house where we spent a lot of time during the summer. You never had to worry about going to someone else’s house. It was a shared place that we all took responsibility for. Everyone just went whenever they could. Which for me meant almost every weekend of the summer. The 14 of us cousins were close growing up. But that only accounts for some of the cousins I had. My mom’s aunts and uncles, and her cousins also came to the lake house during the summer. Not as frequently, but still fairly regularly and always for the 4th of July. The 4th of July at the lake was a big tradition. 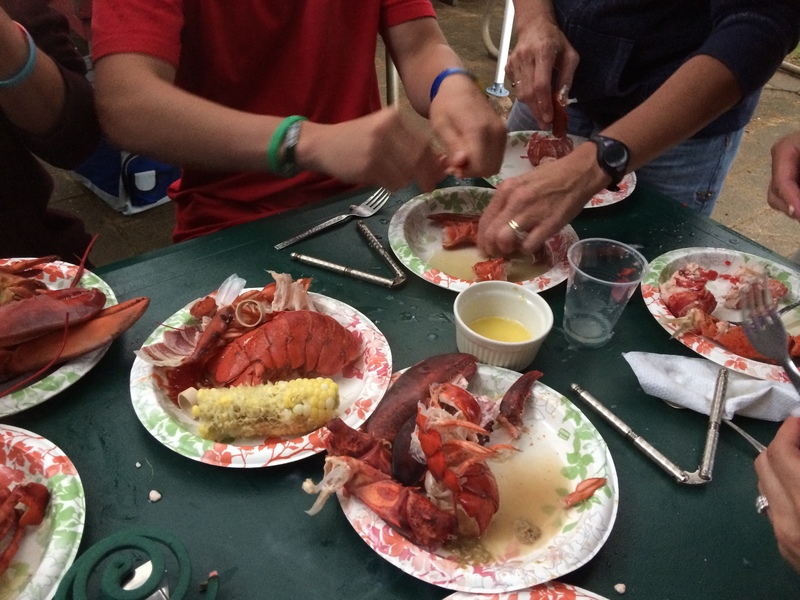 We had an annual lobster/ clambake. I’ve only missed it once in my life. My relatives would come from all over. Sometimes we would only see these relatives at the lake for the clambake, but we knew that once a year we would all get together. And the tradition still continues. This year, if you live on the east coast you would know there was an extra uninvited guest on the 4th of July, hurricane Arthur. Despite the rain and the fact that the best part of being at the lake is being outside, we still had our clambake. Not everyone could make it, but many of us did. Let me try to put into perspective just how big my family is. Despite the fact that my brother (who does the ordering of the lobsters) did a pretty accurate count of who would be there and who would eat lobster, we had 20 extra lobsters. Yes, I said 20 extra lobsters. Yeah, I have a big family. Going through divorce is not easy. No part of it is easy. Even when you are the one asking for the divorce, it still isn’t easy. So the day of my divorce hearing in court finally arrived (the one that actually happened after nine months of cancelled court dates for one reason or another). I work in a junior high school so I go to work very early. Instead of taking the whole day off from work, I went into school in the morning, got the day started, went to a meeting, then left work and went to court. Totally random. Totally off the point. Totally made me smile. It made me think about the other “stuff” going on in life. Like the nice weather we were having and the fact that I have awesome friends who were thinking of me. After several meetings between the lawyers and getting everything signed and agreed upon before going into court, it is finally our turn. It goes about as smoothly as it can for a divorce. I’m feeling emotionally beat up and exhausted. I head back to work and get myself ready to finish up the day. And then I smiled too. My friends are awesome. They think about me enough to intentionally distract me on one of the most difficult days of my life. They intentionally plan to send me a random text to take my mind off of the seriousness of the situation. Divorce is still not easy. Even now that it is over, it is not easy. But my friends and the amazing people in my life make it a little easier by helping me focus on the good “stuff” that is going on in my life. I love football. This might not have come across in my earlier posts or my blog bio, but I do. I love football. I listen almost exclusively to sports talk radio and so, of course, I have been hearing a lot about Ray Rice and the domestic violence issue and the reaction, or lack of reaction, from the NFL. The first problem that I keep hearing relating to this particular situation is that people keep comparing it to players who are being fined and suspended for PED or drug use, which is an inequitable comparison. For better or worse, right or wrong, the NFL does a have a drug abuse policy with set guidelines for punishment and they do not have one for domestic violence situations. The other common argument that I am hearing is that the league needs some type of policy for arrests, while that is probably true, I still do not believe that this will address the domestic violence issue. While I do not claim to be an expert on this particular situation or to know all the facts around it, what I have seen in the video, what I have heard and through my own experience, it does seem to be a classic case of domestic violence. And there is an inherent conflict with domestic violence and pressing charges that lead to arrest. One of the suggestions I heard related to punishments was that they league should wait until they have an arrest, charges or a conviction. That concerns me specifically in relation to domestic violence. This puts the pressure back on the woman for pressing charges, which is exactly what the police and domestic violence advocates don’t support. The problem is that then the woman feels responsible, and that perpetuates the cycle of abuse. One of two things would typically happen. 1) He will promise it will never happen again, she will believe him, and she will not press charges. But then it will happen again. Because that is how the cycle of abuse works. 2) She does press charges, then he faces suspension or fines based on her pressing charges, she feels guilty, he is angry, and it happens again. Because that is how the cycle of abuse works. No good outcomes from either situation. This is why most domestic violence advocates push for laws that take the decision out of her hands. The police file charges whether she wants to or not. But so much of domestic violence is not even seen or reported. The Ray Rice video with his then fiancée happened to be caught on camera at a casino. If that was caught on camera, in an elevator, a fairly public place, what do you think happens behind closed doors? As a survivor of domestic violence, it is scary. The terror of living in that kind of a situation is all consuming and, for me, I just wanted it to end. It is hard to see your way out of it. I didn’t press charges. Maybe I should have, but I didn’t. I left. I protected myself and my family. What will be “enough” of a punishment to (hopefully) make a difference to Ray Rice and make him stop treating his wife this way? What is “enough” of a punishment for the NFL to make a stand to say they won’t tolerate domestic violence? And when do we, as a society, say Enough is Enough. Sometimes it’s the strangest things that get to you, and you can’t always predict what it is. I hurt my back. I was in a car accident 20 years ago, a pretty significant one in which my elbow was crushed and my tricep was severed. It was as gruesome as it sounds. And the lasting effects have been just as bad. Ever since then the strength in my arm hasn’t been the same and about a month ago the pain in my back was so bad I ended up at the ER. Today, I went back to physical therapy to address my back pain and try to strengthen and my arm. My doctor recommended this new physical therapy place and told me that she really liked the woman who owned the place. So for whatever reason I assumed I would be meeting with a woman for my physical therapy. But it wasn’t. It was a man. The receptionist told me that “he” would be with me shortly and for some reason my breath caught and my heart started beating faster. I couldn’t really identify why, but I was shaking. So I stopped freaking out and forced myself to think logically about what was going on. Then it hit me, my ex. He hated when I talked to men and he would have hated that my physical therapist was a man. He would have hated that this man was going to touch me, albeit in a professional manner, he would have freaked. And that is why I was freaking. I’ve been to PT several times over the past few years and when I first got the referral my ex-husband (we were married at the time) freaked out because my physical therapist was a man, a young man to be exact. So even though the PT helped, I began creating excuses as to why I couldn’t go so that my husband would be mad at me. When I had to go to PT again, I made sure I had a woman therapist, which was fine, because she was awesome, but it was kind of stupid of me. But that was the kind of thing that I did. I always tried to manipulate the situation so that he wouldn’t get upset with me. So here I am sitting in the office of my new physical therapist, a man, realizing that when I get home at night, no one is going to grill me about him, or about what he did, or if he touched me, or if I liked him, or make me feel bad about it. I could, very innocently go to a physical therapist and get help and not feel bad about it. In church today we sang a song that hit me for some reason. The song was so beautiful and it made me stop and think about myself. I know that I am a work in progress. I know that I’m not finished and I think that in many ways I too am “unrevealed”. I’m hoping that my time will come and that I will be able to bloom into something amazing. I’m certainly working on it. Starting this blog has been quite an adventure for me. I never really thought of myself as much of a writer. I guess that’s a family thing. We are math and science people, but we never really focused much on writing. I never thought I was a great writer (I still don’t think I’m a great writer, but I find pleasure and comfort in my writing, that I’m going to keep doing it). But to my own surprise I find joy in writing and sharing experiences with people. I hope that you find some joy in reading what I write and maybe you will be there when my time comes to be revealed. Here I am in the midst of a beautiful east coast summer, unwinding from the busy school year, taking a breath, and reflecting on where I am now, and where I’m going. I am a principal of a middle school. I love my job and I love being a principal. I recently got an extension on my contract. I love my school, I love my teachers – they are an amazing support to me, and I absolutely love working with middle school kids – they are the best. So professional life is good – check. I’m a PhD student. I recently completed three years of course work, with an amazingly strong cohort of six (including me) women. Each of us are conducting our research in a wide variety of areas. My research topic is still being refined, but it has become more doable, more applicable, and, in all honestly, more interesting to me. Academic & intellectual life – check. I’m a mom. I have two amazing sons. My oldest son graduated from high school and just finished his first year of college. He’s an outstanding young man. He amazes me with his kindness and generosity, as well as his wit and humor. My younger son is in elementary school, just completed fourth grade probably ready to go to college too, but he’s going to have to wait. He’s smart. He’s funny. He’s handsome. He’s outgoing in ways that I could never be. They are the loves of my life. And yes, they are both momma’s boys. Being a good mom – check. Then I guess that only leaves the love life/ romantic part of my life, and truth be told that is a huge mess. I feel like this is the part of my life I can’t seem to get right no matter how hard I try. But I’m stubborn and I’m not going to give up. I look back on my life a few years ago and it was completely different. At that time, I was living in the beautiful land of denial. The land where everything is wonderful and, well, if not perfect, at least pretty darn good, or so it seemed. But it is unfortunately not a real place to live, at least not forever.